Build bridges out of noodles? Maegan Cary and Daniella Giansante won this year’s pasta bridge competition at O’Hara School. 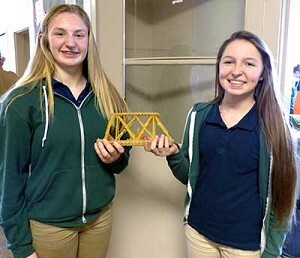 EUGENE — O’Hara School eighth graders last month competed in the annual tradition of bridge breaking. For three weeks, led by science teacher Clint Larson, the students worked in teams to build model bridges using dry pasta. The goal is to design the lightest bridge that will hold the most weight. In the contest, weight is added until the bridge reaches its breaking point. This year’s winners were Maegan Cary and Daniella Giansante, whose dry noodle span held 40.7 pounds. The business community has pushed the project, hoping to prepare an agile and competitive workforce.